Oxidative stress is involved in the pathogenesis of pulmonary fibrosis, therefore antioxidants may be of therapeutic value. Clinical work indicates that N‐acetylcysteine (NAC) may be beneficial in this disease. The activity of this antioxidant was examined on bleomycin-induced lung damage, mucus secretory cells hyperplasia and mucin Muc5ac gene expression in rats. NAC (3 mmol·kg−1·day−1) or saline was given orally to Sprague-Dawley rats for 1 week prior to a single intratracheal instillation of bleomycin (2.5 U·kg−1) and for 14 days postinstillation. NAC decreased collagen deposition in bleomycin-exposed rats (hydroxyproline content was 4,257±323 and 3,200±192 µg·lung−1 in vehicle- and NAC‐treated rats, respectively) and lessened the fibrotic area assessed by morphometric analysis. The bleomycin-induced increases in lung tumour necrosis factor‐α and myeloperoxidase activity were reduced by NAC treatment. The numbers of mucus secretory cells in airway epithelium, and the Muc5ac messenger ribonucleic acid and protein expression, were markedly augmented in rats exposed to bleomycin. These changes were significantly reduced in NAC‐treated rats. These results indicate that bleomycin increases the number of airway secretory cells and their mucin production, and that oral N‐acetylcysteine improved pulmonary lesions and reduced the mucus hypersecretion in the bleomycin rat model. The present work was supported by research grants SAF2000‐0144 and SAF2002‐04667 from CICYT (Ministry of Science and Technology, Spain) and from Zambon Spa (Italy). Pulmonary fibrosis is a chronic inflammatory interstitial lung disease with a potentially fatal prognosis and a poor response to available medical therapy. Oxidative stress appears pathogenetically relevant in this disease 1. The results of short-term studies using oral and intravenous N‐acetylcysteine (NAC) in patients with pulmonary fibrosis have demonstrated the ability of this thiol compound to improve the antioxidant screen of the lung by elevating glutathione levels, as well as restoring pulmonary function tests with a low incidence of adverse effects 2–5. One of the clinically relevant causative agents of pulmonary fibrosis is the antineoplastic agent, bleomycin, that is widely used in animal models to cause oxidant-induced inflammatory and fibrotic lesions in the lung 6. This model of pulmonary fibrosis is useful to assess potential therapeutic agents including antioxidants. Recent experimental work has emphasised the beneficial effect of NAC in bleomycin-induced injury in rodents 7, 8. Some patients with idiopathic pulmonary fibrosis have mucous glandular hypertrophy and mucus hypersecretion in their airways from the beginning of the disease 9. Neutrophils are relevant cells in the pathogenesis of pulmonary fibrosis, and neutrophil-derived products are also related to mucin production in the airways. Reactive oxygen species (ROS) released from activated neutrophils cause mucin Muc5ac synthesis via transactivation of epidermal growth factor receptor in a human pulmonary mucoepidermoid cell line 10. In fact, the epidermal growth factor has been found to be upregulated in patients with pulmonary fibrosis 11 and in bleomycin-induced lung fibrosis in rodents 12. Furthermore, neutrophil elastase induces the overexpression of Muc5ac in cultured human bronchial epithelial cells by an oxidant-dependent mechanism 13. Tumour necrosis factor (TNF)‐α, which is augmented in pulmonary fibrosis 14, induces mucin gene expression and hypersecretion in human airway epithelial cells 15 and upregulation of epidermal growth factor receptor in rats 16. Since neither mucus hypersecretion nor the potential influence of antioxidants on this feature have been previously reported in bleomycin-induced lung fibrosis, the aim of the present study was to examine the changes in the number of airway epithelial mucus secretory cells and mucin Muc5ac messenger ribonucleic acid (mRNA) and protein expression in this disease model, and the effect of the antioxidant NAC. Lung hydroxyproline and morphometric analysis were used to assess the degree of lesions, and lung myeloperoxidase (MPO) and TNF‐α were taken as markers of inflammation. Bleomycin sulphate was from Almirall-Prodesfarma (Barcelona, Spain) and NAC from Zambon (Bresso, Italy). Other chemicals and reagents were from standard commercial sources. Pathogen-free, male Sprague-Dawley rats (200–250 g) received endotracheally, by the transoral route, a single sublethal dose of 2.5 U·kg−1 of bleomycin dissolved in 0.25 mL saline (0.9% NaCl). The dose of bleomycin was selected from previous experiments in this laboratory to cause no mortality but consistent biochemical and histological damage 8. Control animals received the same volume of intratracheal saline instead of bleomycin. Tracheal instillation was carried out under halothane anaesthesia. Fourteen days after endotracheal bleomycin or saline, the animals were killed by a lethal injection of sodium pentobarbital (100 mg·kg−1 intraperitoneally) followed by exsanguination from abdominal aorta. Lungs were weighed and processed separately for biochemical (immediately frozen in liquid nitrogen) and histological studies as indicated below. This study complied with European Community (Directive 86/609/EEC) and Spanish guidelines and was approved by the institutional committee of animal care. Animals were randomly distributed into four experimental groups: 1) group A, vehicle+saline; 2) group B, vehicle+bleomycin; 3) group C, NAC+saline; and 4) group D, NAC+bleomycin. Treatments (vehicle or NAC) were administered orally by gavage on a daily basis (at 09:00 h) starting 7 days prior to the intratracheal instillation of bleomycin up to the conclusion of the experiments (14 days postinstillation). The dose of NAC was 3 mmol·kg body weight−1·day−1 (i.e. 490 mg·kg−1) given as a single dose in a final volume of 1 mL of distilled water as the vehicle 8. The oral administration was selected as usual in the clinical setting 2, 4, 5, and the dose level and schedule were based on previous studies 8. Lung hydroxyproline was determined spectrophotometrically as reported previously 8. Lung MPO activity was measured photometrically, employing 3,3′,5,5′‐tetramethylbenzidine (TMB) as a substrate as outlined previously 17. TNF‐α was measured in lung homogenates by a commercial solid phase sandwich enzyme-linked immunosorbent assay (ELISA) kit according to manufacturer instructions (Diaclone Research, Besançon, France). For morphometric analysis of fibrotic lesions, the lung wasprepared as reported previously 8 and a CUE‐2 (Olympus, Tokyo, Japan) Image Analysis System was used as described previously 18. Fibrotic areas were measured in 10 noncoincident fields at random (magnification 200×, field size 0.59 mm2) and the results expressed in µm2·field−1. For histological study of the secretory cells of the epithelium of the airways, lung sections were stained with Alcian blue and periodic acid-Shiff, and the number of stained secretory cells were determined in at least four independent fields from each of three lung sections obtained for each animal in the different experimental groups 19. Only the large-calibre, preterminal bronchioles were examined, since minimal changes occur in terminal bronchioles 19. The data were expressed as the average of secretory cell counts stained in all fields in the three sections per mm basal lamina. The mucin Muc5ac mRNA transcripts were measured by real-time quantitative reverse-transcriptase polymerase chain reaction (RT‐PCR). The method used for obtaining quantitative data of relative gene expression was the comparative Ct method (ΔΔCt method) as described by the manufacturer (PE‐ABI PRISM 7700 Sequence Detection System; Perkin-Elmer Applied Biosystems, The Perkin-Elmer Corporation, Foster City, CA, USA). Glyceraldehyde 3‐phosphate dehydrogenase (GAPDH) was chosen as the endogenous control gene. This housekeeping gene was used in cultured airway epithelial cells subjected to oxidant stress 20 yet this increases GAPDH mRNA levels in rabbit aorta 21. Total RNA was extracted using Ultraclean total RNA tissue isolation kit (MO Bio, Solana Beach, CA, USA). The PCR primers for rat Muc5ac and rat GAPDH were designed using the Primer Express (PE Biosystems, Morrisville, NC, USA) according to the published rat Muc5ac and GAPDH complement deoxyribonucleic acid (cDNA) sequences (table 1⇓). For Muc5ac, RT of RNA, to generate cDNA, was performed with Taqman RT reagents (N808-0234; PE Biosystems) as indicated by the manufacturer. The specificity of PCR primers was tested under normal PCR conditions and the products of the reaction were electrophoresed into a 2.5% Nusieve® GTG® agarose gel (BMA, Rockland, ME, USA). One single band with the expected molecular size was observed for Muc5ac and GAPDH. For the validation of the ΔΔCt method, the Ct values for target and reference genes were measured at different input amounts of total RNA (25–3,000 ng), then, ΔCt values (target versus reference) were plotted against log total RNA and the absolute value of the slope found was 0.083 (<0.1), thus indicating a similar efficiency of the two systems (table 1⇓). For Western blot analysis of Muc5ac, individual bronchi were homogenised in five volumes of ice-cold lysis buffer (50mM Tris, pH 7.4, 1mM ethylenediamine tetraacetic acid, 2mM MgCl2, 0.5 mM phenylmethylsulphonyl fluoride, 1mM dithiotreitol, 2 µg·mL−1 leupeptin, 5 µg·mL−1 aprotinin, 5 µg·mL−1 benzamidine and 5 µg·mL−1 pestatin). To remove insoluble materials, tissue lysates were centrifuged at 14,000×g for 20 min at 4°C. Total protein was estimated using bicinchoninic acid protein assay reagent (Pierce, Rockford, IL, USA). Aliquots of supernatants containing 25 µg total protein were suspended in sodium dodecylsulphate (SDS) sample buffer and boiled for 5 min. Proteins were separated by SDS‐polyacrylamide gel electrophoresis in 8% acrylamide-bisacrylamide (80:1) gel for 5 h. This acrylamide-bisacrylamide proportion and separation time improves the resolution of large molecular weight glycoproteins. The resulting gel was equilibrated in the transfer buffer: 25 mM Tris-HCl, 192 mM glycine, and 20% (v/v) methanol, pH 8.3. The proteins were then transferred electrophoretically to nitrocellulose membranes, which were incubated with 5% fat-free skimmed milk in phosphate-buffered saline (PBS) containing 0.5% bovine serum albumin (BSA) and 0.05% Tween 20 for 1 h, and incubated with mouse monoclonal antibody (mAb) to Muc5ac (clone 45M1, 1:500; NeoMarkers, Fremont, CA, USA) for 2 h at room temperature. Bound antibody was visualised according to standard protocols forthe avidin-biotin-alkaline phosphatase complex method (ABC kit; Vector Laboratories, Burlingame, CA, USA). The molecular weight marker was myosin (Kaleidoscope Prestained Standard; Biorad, Hercules, CA, USA). The corresponding negative controls were carried out in the absence of primary antibody (data not shown). For lectin analysis, membranes were stained with wheat germ agglutinin (WGA) using the Vectastain horseradish peroxidase kit (Vector Laboratories, Atom S.A., Barcelona, Spain) according to the manufacturer's instructions. Muc5ac protein measurement by ELISA was carried out as outlined previously 16. In brief, 100 µg total protein was incubated with bicarbonate-carbonate buffer at 40°C in a 96‐well plate until dry. Plates were washed with PBS and blocked with 2% BSA (fraction V; Sigma, St Louis, MO, USA) for 1 h at room temperature. After three washes, plates were incubated with 50 µL of mouse mAb (Neomarkers) at 1:100. After 1 h, plates were washed with PBS and then incubated with 100 µL of horseradish peroxidase-goat antimouse immunoglobulin G conjugated (1:10,000). Colour reaction was developed with TMB peroxidase solution (Sigma) and stopped with 1 M H2SO4. Absorbance was read at 450 nm. The corresponding negative controls were carried out without tissue protein or in the absence of primary antibody (data not shown). Data are expressed as mean±sem of n experiments. Statistical analysis was carried out by analysis of variance followed by appropriate post hoc tests including Bonferroni correction and unpaired t‐tests. Significance was accepted when p<0.05. Lung hydroxyproline levels, a marker of collagen deposition, were increased at 14 days after bleomycin exposure, and treatment with NAC significantly reduced the hydroxyproline content in bleomycin-exposed rats although levels remained higher than those found in animals not exposed to bleomycin (fig. 1a⇓). a) Lung tissue levels of hydroxyproline, b) myeloperoxidase (MPO) activity, and c) tumour necrosis factor (TNF)‐α, in experimental groups A (vehicle+saline), B (vehicle+bleomycin), C (N‐acetylcysteine (NAC)+saline) and D (NAC+bleomycin) at 14 days postinstillation. Treatment with NAC reduced the bleomycin-induced elevation of lung hydroxyproline, MPO and TNF‐α. Values represent mean±sem of eight (A), 11 (B), five (C) and 11 (D) animals. *: p<0.05 versus A; #: p<0.05 versus B. Lungs from rats in groups A and C were histologically normal (data not shown). Lungs from rats in group B at 14‐days postexposure showed multifocal areas of severe inflammation and intense fibrosis (41,362±8,501 µm2, n=6). In contrast, NAC‐treated animals (group D) showed a less severe pattern of pulmonary lesion, consisting of multifocal areas of moderate inflammation and slight fibrosis (5,431±1,767 µm2, n=5; p<0.05 versus group B). Lung MPO activity increased in bleomycin-exposed rats compared with the saline group and treatment with NAC resulted in a significant reduction (fig. 1b⇑). The augmented lung tissue TNF‐α levels were also reduced in bleomycin-exposed rats receiving NAC (fig. 1c⇑). The number of stained mucus secretory cells in group A was 20.1±1.4 cells·mm basal lamina−1 (n=5). In group C, 21.7±1.6 cells·mm−1 were obtained (p>0.05 versus group A). In the animals exposed to bleomycin (group B), a significant increase in secretory cell counts was observed (45.2±4.7 cells·mm−1, n=9; p<0.05 versus group A) that was decreased in NAC‐treated rats (group D 29.0±4.5 cell·mm−1, n=10; p<0.05 versus group B; p>0.05 versus group A). Representative photomicrographs are shown in figure 2⇓. Representative photomicrographs of rat airway epithelium stained with Alcian blue and periodic acid-Shiff to observe mucus secretory cells at 14 days after bleomycin or saline endotracheal instillation. Stained secretory cells are indicated by the arrows. a) In the controls (group A (vehicle+saline)), the secretory cell count was minimal. b) Bleomycin (group B (vehicle+bleomycin)) increased the number of secretory cells, and c) treatment with N‐acetylcysteine (NAC) (group D (NAC+bleomycin)) reduced the bleomycin-induced effects. Scale bars=50 µm. Muc5ac mRNA (real-time RT‐PCR) and protein (Western blot and ELISA) were increased in bleomycin-exposed animals compared with controls and this enhanced expression was reduced in NAC‐treated animals (fig. 3⇓). Figure 3a⇓ shows data from three animals for each of the experimental groups, A, B, C and D at 14 days postbleomycin or postsaline intratracheal instillation. The Ct values for GAPDH were similar in the different samples thus confirming the value of this housekeeping gene as an endogenous control. a) Relative quantitation of the messenger ribonucleic acid (mRNA) levels of Muc5ac and glyceraldehyde 3‐phosphate dehydrogenase (GAPDH) in rat bronchus determined by using real-time reverse-transcriptase polymerase chain reaction by the ΔΔCt method. Columns show the fold increase in expression of Muc5ac relative to GAPDH values as mean±sem of the 2−ΔΔCt values. Data from three animals for each of the experimental groups, A (vehicle+saline), B (vehicle+bleomycin), C (N‐acetylcysteine (NAC)+saline) and D (NAC+bleomycin) are shown at 14 days postinstillation. b) Muc5ac protein in rat bronchus was determined by Western blot. For each group, lane 1 shows the Western blot analysis with anti-Muc5 mAb, and lane 2 shows the wheat germ agglutinin lectin analysis. A representative experiment of three independent experiments is shown for each of the experimental groups. The molecular weight marker is shown on the left (213 kD). c) Muc5ac protein in rat bronchus was determined by enzyme-linked immunosorbent assay. The mean±sem values of three independent experiments are shown. Bleomycin increased the expression of Muc5ac protein and treatment with NAC reduced this effect. *: p<0.05 versus A; #: p<0.05 versus B.
Muc5ac protein in rat bronchus was determined by Western blot (fig. 3b⇑). A band of high molecular weight was identified as Muc5 mucin because it was immunostained with anti-Muc5 antibody and stained with WGA lectin. This immunostained band was markedly augmented in bleomycin-challenged rats (group B) and it was virtually abolished in NAC‐treated animals (group D). Other bands of lower molecular weight reacted with WGA but were not immunostained, and correspond to unidentified glycoconjugates present in bleomycin-challenged rats. The results of the present study show that treatment with NAC, pre- and postbleomycin instillation was effective in reducing the lung injury produced by this antineoplastic agent in rats, as assessed by reductions in lung hydroxyproline content and morphometric analysis of fibrotic lesions. This finding adds to a substantial amount of recent work showing the activity of NAC, either systemically or locally administered, to prevent bleomycin-induced lung damage and subsequent fibrosis in rodents 7, 8, 22, 23. Similarly, the activity of other antioxidants against pulmonary fibrosis produced by bleomycin has been recently demonstrated 24. The effectiveness of NAC in this experimental model would be consistent with the beneficial effect shown for this thiol compound in patients with idiopathic pulmonary fibrosis 2–5. However, differences between human lung fibrosis and the bleomycin model 25, as well as the high dose of NAC and treatment design used in this study, impose limitations to the potential clinical relevance of these findings. The mechanism through which NAC could limit pulmonary fibrosis is still uncertain, but is likely to be related to its ability to reduce damage to lung structures in the early inflammatory stage of the disease process 23. The pulmonary injury produced by bleomycin involves, as an initial event, the generation of oxidant species by an iron-dependent mechanism 6. Further damage is probably elicited by increased amounts of ROS produced by activated inflammatory cells recruited into the bleomycin-induced pulmonary lesions 1. Therefore, NAC could reduce the ROS production and/or ROS‐induced aggression in the early inflammatory phase, since NAC is a direct oxygen radical scavenger but could also promote glutathione production by supplying l‐cysteine 23. NAC has been demonstrated to decrease the inflammatory infiltrate, assessed as lung MPO activity, both at early (3 days) 17 and late (14 days; fig. 1b⇑) time points after bleomycin exposure. Also, NAC improves altered oxidant stress markers 23 and prevented the upregulation of P‐selectin in bleomycin-induced lung fibrosis 17. Furthermore, the enhanced expression of the inflammatory cytokine TNF‐α in this model is reduced by NAC (fig. 1c⇑) 23. NAC has also been reported to interfere with the activation of nuclear factor‐κB and other inflammatory cytokines 7, 23 in this disease model. This hypothesis of a protective effect of NAC on the inflammatory component of the bleomycin-induced damage does not exclude a potential effect of NAC on fibrogenesis since it has been reported that NAC inhibits fibroblast proliferation in vitro 26. The existence of mucus hypersecretion and enhanced expression of Muc5ac has been reported in different in vivo and in vitro models of acute lung damage 10, 16. However, to the best of the authors' knowledge, this is the first report of an increased number of mucus secretory cells in the epithelium of the airways accompanied by augmentation of Muc5ac mRNA and protein in this model of bleomycin-induced pulmonary fibrosis. This finding in the animal model would be consistent with the clinical finding of mucus hypersecretion in some patients with pulmonary fibrosis 9. The causes underlying the goblet cell hyperplasia and mucin overproduction in this model were not investigated, but the activating role of neutrophil-derived products such as ROS and elastase, the enhanced production of TNF‐α, and the upregulation of epidermal growth factor are likely to contribute 10, 13. Interestingly, Muc5ac mRNA decreases to control levels with NAC treatment, while lung hydroxyproline, MPO and TNF‐α remain significantly above levels in group A. Full inhibition by antioxidants of increased Muc5ac has been reported in other models 10. By contrast, this and other studies failed to show full inhibition of collagen deposition and inflammation with antioxidants 7, 8, 22, 30. These findings suggest that Muc5ac overexpression is strongly related to oxidant stress while the fibrogenesis and inflammatory processes result from a variety of stimuli including ROS 6, thus explaining the partial activity of antioxidants. Short-term clinical studies have demonstrated that NAC may contribute to the treatment of pulmonary fibrosis 2–5. This thiol compound is established in the clinical setting as an antioxidant and mucolytic drug, and proved beneficial in chronic bronchitis 27. The ability of NAC to reduce the increased number of mucus secretory cells in airway epithelium and the upregulation of Muc5ac in the bleomycin model of lung fibrosis has been demonstrated. 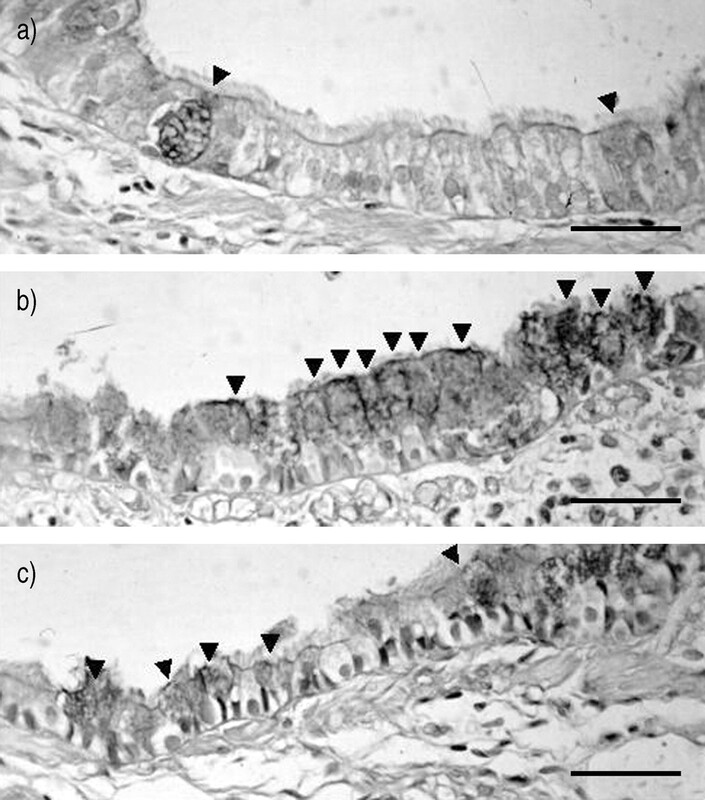 This finding is in keeping with previous data for NAC preventing the goblet cell hyperplasia 19, mucus hypersecretion 28 and morphometric and ventilation alterations 29 in a rat model, or bronchitis produced by cigarette smoke exposure as well as the enhanced expression of Muc5ac in sensitised rats after allergen challenge 30. These observations indicate that the activity of NAC in different models of lung inflammation is not merely related to its mucolytic properties, since its antioxidant properties may also influence the intracellular signalling involved in mucus secretion. In summary, this study confirms the beneficial effect of oral N‐acetylcysteine in the bleomycin-induced lung fibrosis in the rat, and further extends this observation to demonstrate the inhibition of the mucus secretory cell hyperplasiaandenhanced expression of the Muc5ac gene shown in this disease model. Additional studies are required for better assessment of the antihypersecretory potential of N‐acetylcysteine supplementation as an adjunct therapy for patients with pulmonary fibrosis, including that produced during bleomycin treatment. MacNee W, Rahman I. Oxidants/antioxidants in idiopathic pulmonary fibrosis. Thorax 1995;50: Suppl. 1, S53–S58. Meyer A, Buhl R, Magnussen H. The effect of oral N‐acetylcysteine on lung glutathione levels in idiopathic pulmonary fibrosis. Eur Respir J 1994;7:431–436. Meyer A, Buhl R, Kampf S, Magnussen H. Intravenous N‐acetylcysteine and lung glutathione of patients with pulmonary fibrosis and normals. Am J Respir Crit Care Med 1995;152:1055–1060. Behr J, Maier K, Degenkolb B, Krombach F, Vogelmeir C. Antioxidative and clinical effects of high dose N‐acetylcysteine in fibrosing alveolitis. Adjunctive therapy to maintenance immunosuppression. Am J Respir Crit Care Med 1997;156:1897–1901. Behr J, Degenkolb B, Krombach F, Vogelmeier C. Intracellular glutathione and bronchoalveolar cells in fibrosing alveolitis: effects of N‐acetylcysteine. Eur Respir J 2002;19:906–911. Hay J, Shahzeidi S, Laurent G. Mechanisms of bleomycin-induced lung damage. Arch Toxicol 1991;65:81–94. Hagiwara SI, Ishii Y, Kitamura S. Aerosolized administration of N‐acetylcysteine attenuates lung fibrosis induced bybleomycin in mice. Am J Respir Crit Care Med 2000;162:225–231. Cortijo J, Cerda-Nicolas M, Serrano A, et al. Attenuation by oral N‐acetylcysteine of bleomycin-induced lung injury in rats. Eur Respir J 2001;17:1228–1235. Andoh Y, Aikawa T, Shimura S, Sasaki H, Takishima T. Morphometric analysis of airways in idiopathic pulmonary fibrosis patients with mucous hypersecretion. Am Rev Respir Dis 1992;145:175–179. Baughman RP, Lower EE, Miller MA, Bejarano PA, Heffelfinger SC. Overexpression of transforming growth factor-alpha and epidermal growth factor-receptor in idiopathic pulmonary fibrosis. Sarcoidosis Vasc Diffuse Lung Dis 1999;16:57–61. Madtes DK, Busby HK, Strandjord TP, Clark JG. Expression of transforming growth factor-alpha and epidermal growth factor receptor is increased following bleomycin-induced lung injury in rats. Am J Respir Cell Mol Biol 1994;11:540–551. Piguet PF. Is “tumor necrosis factor” the major effector of pulmonary fibrosis?. Eur Cytokine Netw 1990;1:257–258. Borchers MT, Carty MP, Leikauf GD. Regulation of human airway mucins by acrolein and inflammatory mediators. Am J Physiol 1999;276:L549–L555. Takeyama K, Dabbagh K, Lee HM, et al. Epidermal growth factor system regulates mucin production in airways. ProcNatl Acad Sci USA 1999;96:3081–3086. Serrano-Mollar A, Closa D, Cortijo J, et al. P‐selectin upregulation in bleomycin induced lung injury in rats: effect of N‐acetylcysteine. Thorax 2002;57:629–634. Sales A, Ruíz A, Llombart-Bosch A. Comparative morphometric evaluation of microvessel density and nuclear area in ductal carcinoma in situ and hyperplastic ductal breast lesions. Breast J 1999;8:21–25. Rogers DF, Godfrey RWA, Majumdar S, Jeffery PK. OralN‐acetylcysteine speeds reversal of cigarette smoke-induced muocus cell hyperplasia in the rat. Exp Lung Res 1988;14:19–35. Antonicelli F, Parmentier M, Drost EM, et al. Nacystelyn inhibits oxidant-mediated interleukin‐8 expression and NF‐κB nuclear binding in alveolar epithelial cells. Free Rad Biol Med 2002;32:492–502. Ito Y, Pagano PJ, Tornheim K, Brecher P, Cohen RA. Oxidative stress increases glyceraldehyde‐3‐phosphate dehydrogenase mRNA levels in isolated rabbit aorta. Am J Physiol 1996;270:H81–H87. Shahzeidi S, Sarnstrand B, Jeffrey PK, Mcanulty RJ, Laurent GJ. Oral N‐acetylcysteine reduces bleomycin-induced collagen deposition in the lungs of mice. Eur Respir J 1991;4:845–852. Serrano-Mollar A, Closa D, Prats N, et al. In vivo antioxidant treatment protects against bleomycin-induced lung damage in rats. Br J Pharmacol 2003;138:1037–1048. Tamagawa K, Taooka Y, Maeda A, Hiyama K, Ishioka S, Yamakido M. Inhibitory effects of a lecithinized superoxide dismutase on bleomycin-induced pulmonary fibrosis in mice. Am J Respir Crit Care Med 2000;161:1279–1284. Borzone G, Moreno R, Urrea R, Meneses M, Oyarzún M, Lisboa C. Bleomycin-induced chronic lung damage does not resemble human idiopathic pulmonary fibrosis. Am J Respir Crit Care Med 2001;163:1648–1653. Cantin AM, Larivee P, Begin RO. Extracellular glutathione suppress human lung fibroblast proliferation. Am J Respir Cell Mol Biol 1990;3:79–85. Stey C, Steurer J, Bachmann S, Medici TC, Tramèr MR. The effect of oral N‐acetylcysteine in chronic bronchitis: a quantitative systematic review. Eur Respir J 2000;16:253–262. Rogers DF, Turner NC, Marriott C, Jeffery PK. Oral N‐acetylcysteine or S‐carboxymethylcysteine inhibit cigarette smoke-induced hypersecretion of mucus in rat larynx and trachea in situ. Eur Respir J 1989;2:955–960. Rubio ML, Sanchez-Cifuentes MV, Ortega M, et al. N‐acetylcysteine prevents cigarette smoke-induced small airways alterations in rats. Eur Respir J 2000;15:505–511. Blesa S, Cortijo J, Mata M, et al. Oral N‐acetylcysteine attenuates the rat pulmonary inflammatory responses to antigen. Eur Respir J 2003;21:394–400.